Preschoolers and even older kids like my youngest daughter who is 11 (I know right, she is 11 but she still enjoys watching Nickelodeon JR and Playhouse Disney at times still!!! 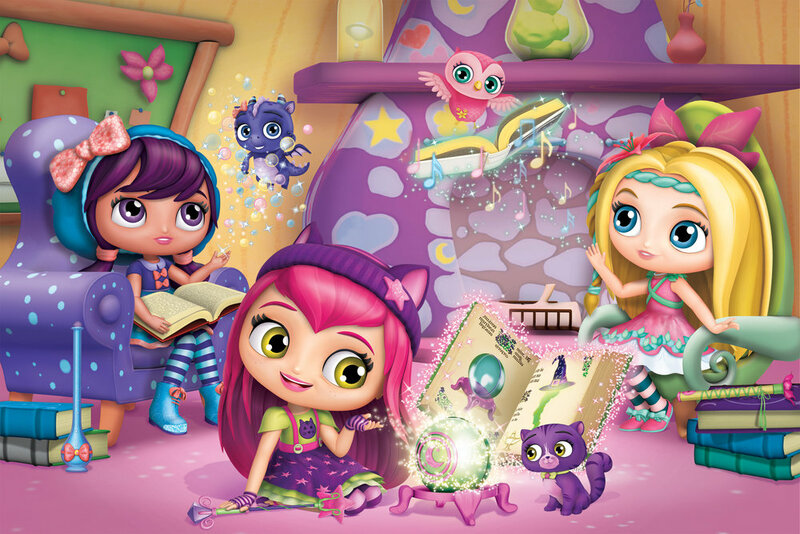 ), can now enter a magical world of spellbinding adventures with the Little Charmers, a brand-new animated preschool series that celebrates the magic of friendship, airs weekdays at 8.35 am (WIB/TH) and 9.35 am (HK/MY/PH/ SG) on Nick Jr. in Asia, which started on the 6th July. This series is a production of Nelvana Enterprises and Spin Master Entertainment, follows best friends and Charmers-in-Training Hazel, Posie and Lavender as they do their best to solve everyday problems and in the process, find themselves in the middle of funny situations. Together, the three Charmers learn that with a little imagination, friendship and teamwork, they can overcome just about any magical mishap they encounter. In the series premiere, “Prince Not So Charming,” Hazel and her friends turn a frog prince into a real prince and must teach him to be charming before time runs out and he reverts back into a frog. •Hazel Charming – Hazel Charming is a 7-year-old Charmer-In-Training and main character of Little Charmers. She is the daughter of the Enchantress and Mr. Charming. With her pet, Seven, this spunky little girl always has the best of intentions - even if it does get her into sticky situations. Hazel is fair-skinned with pale pink lips and gold eyes. She has long magenta hair reaching just below her hips and covers her ears, with bangs shaped like a heart at the center of the forehead. She wears a dark purple cat-ear hat with light pink and fuchsia accenting; including a star on the left of the hat. She wears a light green shirt with a purple cat head at the center with a dark purple jumper that has fuchsia star print and matching suspenders. Two layers of skirting stick out from below it in the color of light green and pale mint. She also wears dark purple and lilac leggings, dark purple flats with lilac cat heads on the toe and a single dull pink strap across the foot, and a pair of dark purple and lilac striped fingerless gloves. •Posie –She comes from a huge family of 30 siblings and so-far the only named one is her older brother, Parsley. Posie is a pale-fair skinned girl with deep blue eyes and peach lips. She has pretty long blonde hair with her fringes frame her face nicely. She has a turquoise braid that goes across her forehead, with it tied together with brown and blonde hair and held with a pink flower and a blue scrunchie. Posie wears a pink dress with a turquoise and teal leaf pattern on the bottom portion, and straps of turquoise that go across the chest with a bow on each shoulder. White skirting hangs from the bottom of her dress. She also wears a pair of dark teal and very pale pink leggings with pink flats that have a blue ribbon at the tongue of each shoe. Lavender is a brown-skinned girl with light-purple eyes and dull, dark-pink lips. She has long black with streaks of purple through it. Her fringe are long enough to go past her eyebrows but do not cover her eyes. The rest of her hair is worn into curly pigtails at the bottom of her head. Lavender wears a dark blue blouse with light indigo collar and two pink bows. Her blue skirt is about knee-length with speckles of very pale blue and dark purple and a lining of pink ruffles along the bottom. She also dons a pair of sky blue and dark blue stockings, and blue boots with purple coloring inside and bottom. The string is pink, while the toe is a glittering sky blue. So cute! My daughter will surely love it!